Cyrtanthus flammosus Snijman & Van Jaarsv. 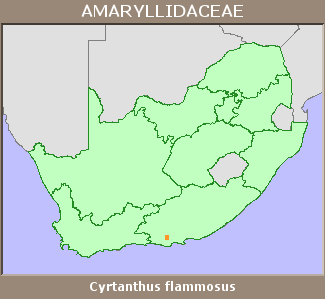 Known from one site in the Baviaanskloof. Not threatened due to the inaccessibility of its habitat. Snijman, D.A., van Jaarsveld, E.J. and Ward-Hilhorst, E. 1995. Cyrtanthus flammosus. Flowering Plants of Africa 54:100-103. Victor, J.E. 2002. South Africa. In: J.S. Golding (ed), Southern African plant Red Data Lists. Southern African Botanical Diversity Network Report 14 (pp. 93-120), SABONET, Pretoria.